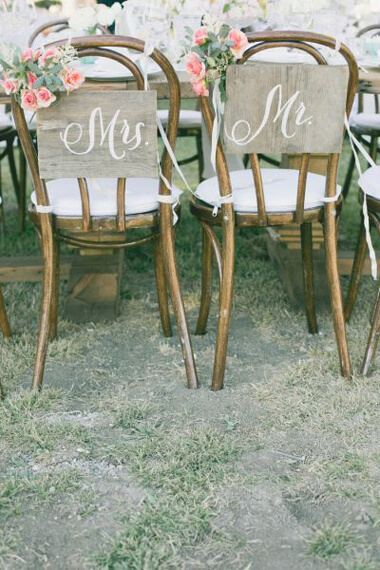 How cute are these DIY wedding chair back decorations for the bride and groom? 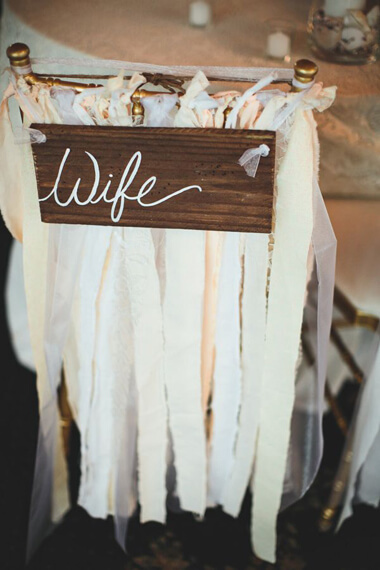 Because weddings are all about the details, why not put some thought into coming up with a design for decorating the backs of the bride and groom chairs at the reception? Its a quaint and charming way to say, “Someone special sits here”. 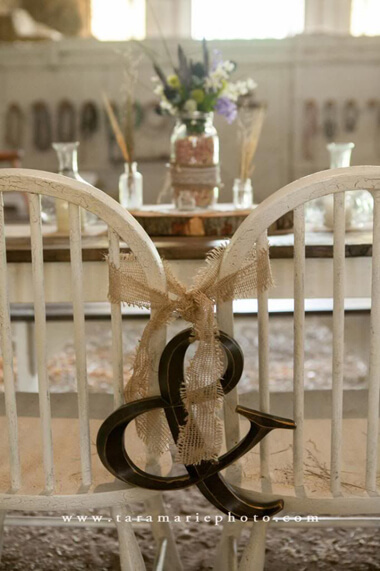 In the design shown above, chair back decorations for the bride and groom’s chair backs were created in keeping with their spring theme wedding. White cardboard discs were cut and the edges were trimmed with blue ribbon. “Mr.” was written on one, and ” Mrs.” on the other, simply using a blue felt marker. Fabric roses and leaves were then glued to the lower half of each disc using hot glue. A hole was punched at the top of each disc so they could be suspended to the backs of chairs with string. Overall, so simple to do, but the effect is really fabulous and charming. You can decorate the round cardboard discs in so many different ways, depending on the wedding theme or the season (if having a seasonal wedding theme). In this case it was a spring wedding, but fall colors and autumn leaves could be a great option for the chair backs at an autumn wedding. Silver and snowflakes might be perfect for a winter wedding. 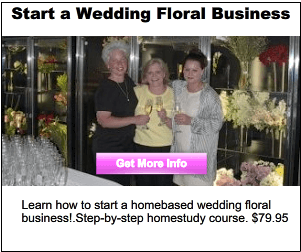 Summer colors and flowers would do the trick for a summer wedding. 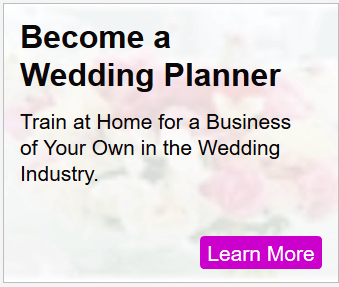 There’s so many other ideas you could run with – just use your imagination and see what you come up with. 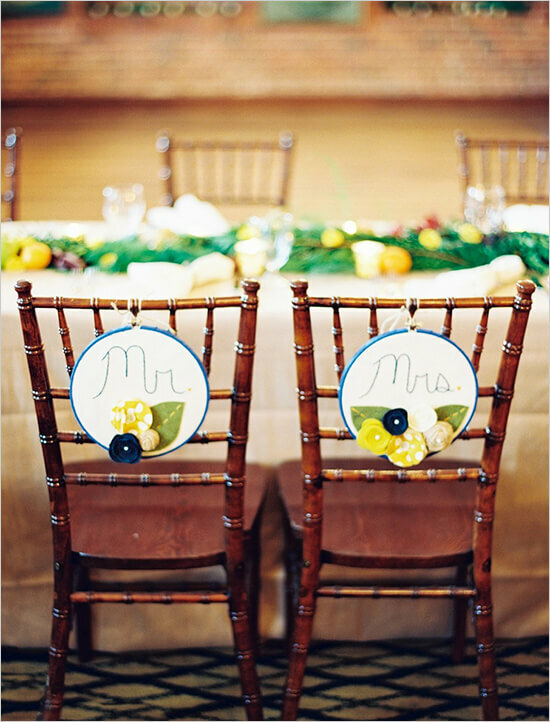 Have you made your own DIY wedding chair back decorations? We’d love to see them and maybe feature them here! 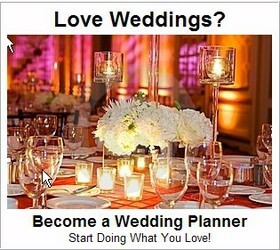 Leave a comment or shoot us an email! These playful “Mrs. 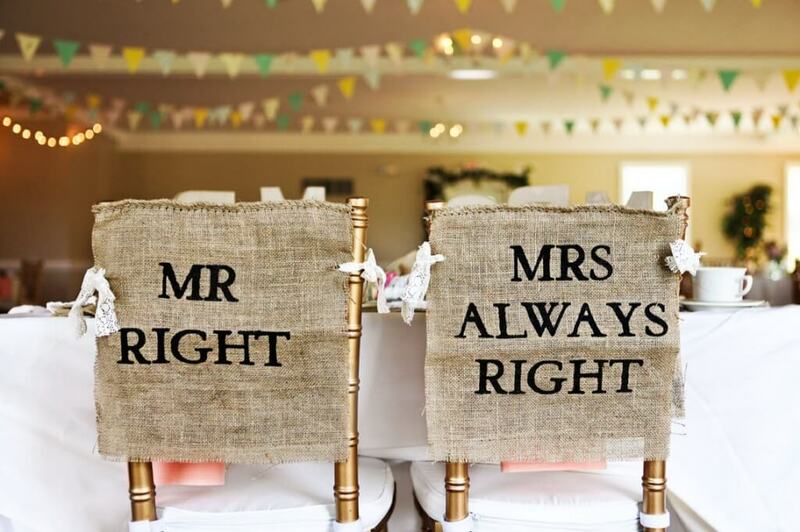 Always Right” bride and groom chair back covers from Heart of Gold are adorable, and put a fun twist on the idea!